Error: "The page is not working. The site redirected you too many times." Attention. 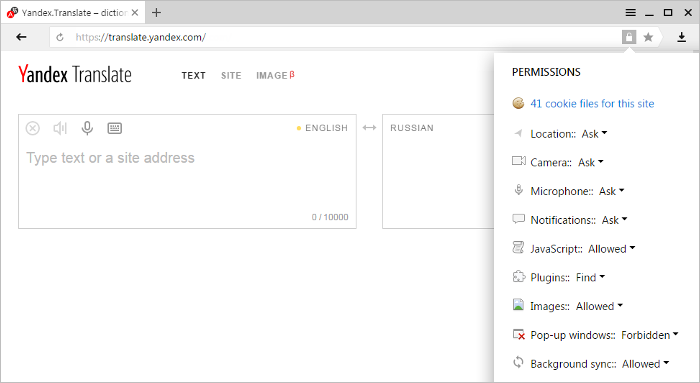 Yandex Browser permits storing cookies by default. A cookie is a small piece of data that is sent by the web server and stored on the user's computer. If a user must log in to access a site, then their username and password may be stored in a cookie. That way, you won't need to enter them when you visit the site again. If you select products from an online store, cookies may store information about products you added to your cart. If you leave a site without placing an order and then return to it, you will see the products you added to your cart previously. If pages on the site need to be personalized, your personal information may be stored in a cookie. For example, let's say you enter your name the first time you visit a site. When you visit in the future, you may be greeted with "Hello, Alice". Cookies can be used for malicious purposes. If someone else uses your computer and the passwords are saved in cookies, they can access your site accounts. Cookies can be used to find out what pages you've visited and use this data to display obtrusive ads. In general, disabling cookies will cause you more inconvenience than it's worth, but if you want to do everything possible to prevent your data from leaking, you will need to disable cookies. However, some sites may stop working properly after you do this. Regularly deleting cookie files reduces the risk of your personal data being leaked and used without authorization. In addition, deleting cookies can free up hard disk space (the browser allocates part of the memory for cookies and if you visit lots of different websites this can be quite large). Attention. Deleting all cookies means you automatically sign out of accounts on most websites. Click → Advanced → Clear history. Tip. You can open the Clear history window by pressing Keyboard shortcuts Ctrl + Shift + Del (on Windows) or Shift + ⌘ + Backspace (on macOS). Under Delete the following, select the time range you want to delete cookies for. Select Cookies and other website and plugin data (disable all the other options if you only want to delete cookies). Click or in the right half of the SmartBox. The screen will list all permissions for that page. Click the <...> cookie files for this site link. A window opens that lists all cookies that have been set by the open page. 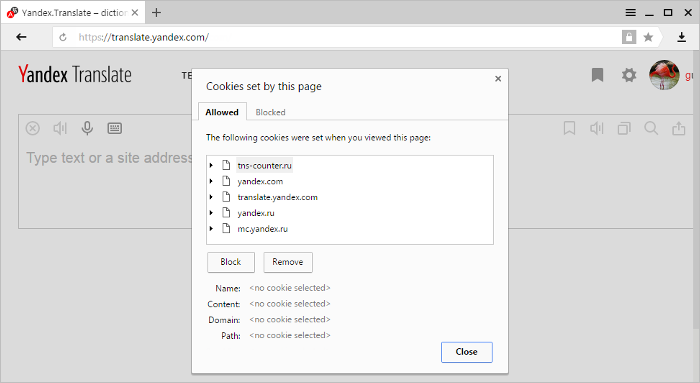 Under Cookies, turn on the option Block sites from setting any data. You can set exceptions for cookies in the browser settings. Attention. By default, all websites are allowed to save cookies. You may need to manually allow saving cookies after you have disabled saving cookies. Under Cookies, turn on the option Allow local data to be set (recommended). Under Cookies, click Manage exceptions. In the list of pages that opens, select the appropriate page and click the icon to the right of its name. If a webpage has a redirect loop, you will see the message "The webpage is not working. The site redirected you too many times." 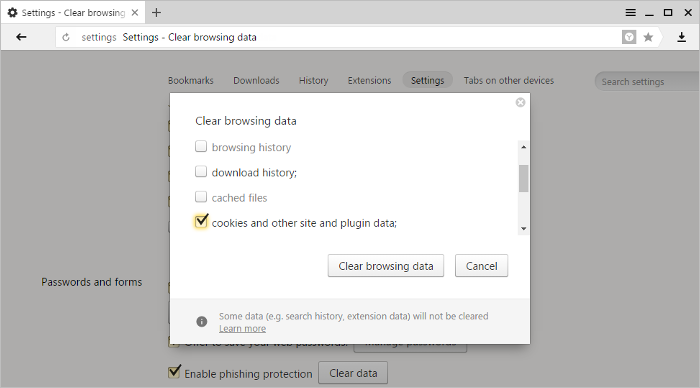 In the Cookies section, clear the option Block third-party cookies and site data. Some website features may stop working after cookies have been blocked. For example, notifications that you were getting earlier in the browser may stop appearing. If you see the icon on the right side of SmartBox, it means that you blocked cookies on that page. Turn on the Allow local data to be set (recommended) option. 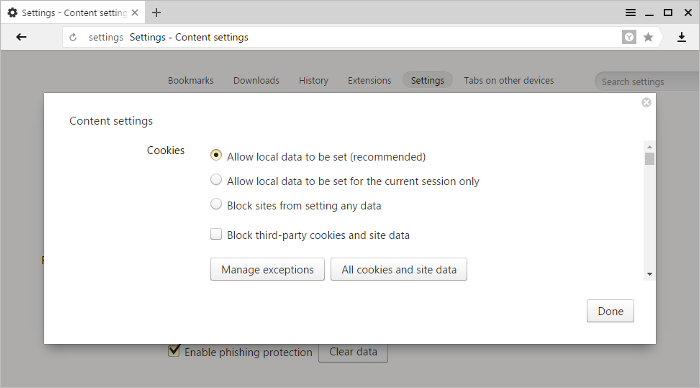 Turn off the Block third-party cookies and site data option. Click on the name of the site. In the drop-down window, select Allow.